Since its first flagship model was launched in August 2011, a total of over 57.36 million Xiaomi phones have been shipped as of today (The number is 52.3 million as of June 2014), according to the company. 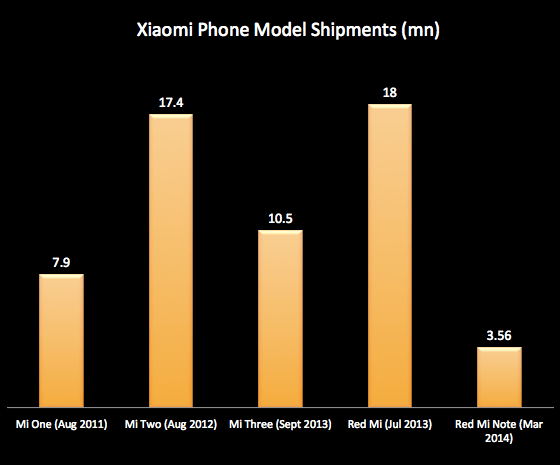 Unsurprisingly, Mi 3, its third flagship phone launched in September 2013, is way less popular than Red Mi, a lower-spec and lower-cost model released two months before the Mi 3 launch but quickly gained traction, as you can see in the chart above. People don’t like Mi 3 for it’s more expensive, not well-designed, and the system doesn’t seem that stable. Red Mi Note, a phablet launched in March this year, seems even more potential than Red Mi, for it’s way more cheaper and considered better designed than all of precious Xiaomi models. With 5.5″ HD IPS display, MTK octa-core processor, 3,100 mAh battery, the Red Mi Note was priced at 999 yuan (about US$160) at launch and now 799 yuan (about US$130) — less than half prices for Xiaomi flagship models. But the company would continue to launch high-spec, higher-priced flagship models. It launches its fourth flagship Android phone today. It’s not much of a surprise that the model has better specs and the two models (16 G and 64 G) are priced the same as its brothers (RMB1999 for the 16 GB version and RMB2499 for 64GB). TDD/FDD – LTE models won’t be out before September. It has a 5″ screen and the design looks similiar to some other smartphones (iPhone 5 with a bigger screen? ), although the company put much emphasis on the design of the phone frame, as Lei Jun, CEO of the company, said at the launch event today. As expected, the long-rumored Xiaomi fitness band is launched today as well.The company has been introducing accessories and appcessories, developed in-house or through companies funded by Xiaomi, to accompany its core products, mobile devices and smart home products. It won’t be surprising that more gadgets will be added later on. 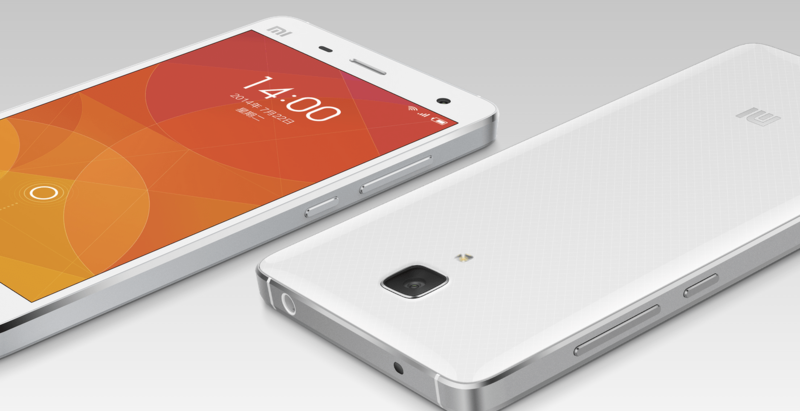 The Chinese startup that produces the band is funded by Xiaomi, too. Like some of those Xiaomi accessories, it’s sold at cost, too. It’s priced at RMB79 (about US$13). But it’s so low that we cannot help wondering whether it’s thanks to the low cost manufacturing advantage China has or that the cost of building a fitness tracking product (hardware design and software) has been driven to this low. The band is able to communicate with MIUI, the customized Android system powering all Xiaomi devices. 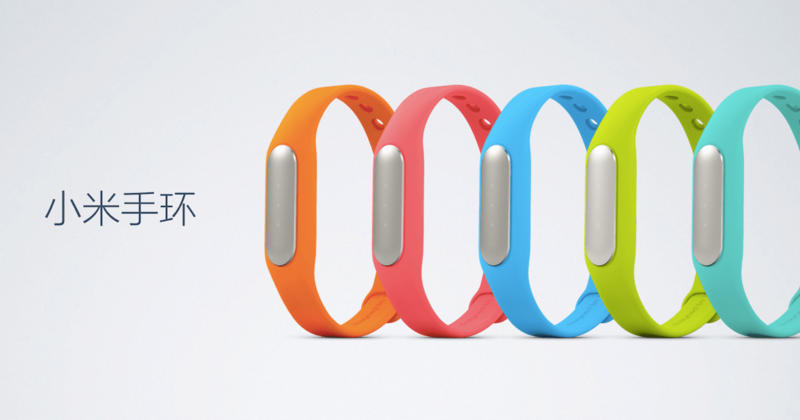 So the band can, apart from tracking activities/sleep and working as an alarming device, unlock your Xiaomi phone. The tracking data will be stored in MIUI’s Cloud.